An award winning book. Seven countries' immigration policies... and the results. Immigration is why Mexico lost Texas ... and the Palestinians lost Israel. Two successive but changed immigration policies … clear successes for Australia, mixed results for Canada. Stable racial demographics in Singapore ... thanks to immigration. Anti-immigrant immigration in France ... conflicting policies don't work. United States: Open immigration worked. Quota restrictions worked. Preference system hasn't. Countries that consistently followed guidelines laid out in Immigration have been rewarded with highly-successful immigration policies. Those that ignored the guidelines have endured severely unsatisfactory results ... or even disaster. "... it is nearly impossible to talk about a controversial issue such as immigration without the conversation turning contentious. 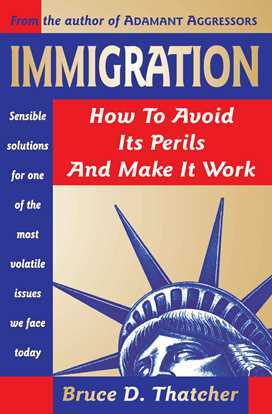 Thatcher approaches the problems of immigration from a historical perspective so that the reader can see the flaws that actually exist rather than perceived flaws presented by those with an agenda. ...this historical approach allows readers to form their own conclusions." "... an extremely interesting and powerful work. Immigration would be a reasonable guide for a senator on Capital Hill just as easily as it could become a well-thumbed reference for a political science student." "... Immigration provides keys to solid reform, making it a top recommendation for any collection looking for a clear coverage of reform options ... goes far beyond your usual history or immigration issues coverage and weaves a blueprint for action ..."